Game Boy is the most successful video game system ever developed. 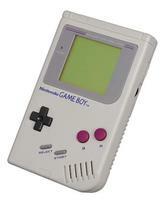 Since its introduction in 1989, Game Boy has sold well over 150 million systems worldwide. Game Boy evolved over the years with Game Boy pocket in 1996 and Game Boy Color in 1998. This item is an Old Style Gameboy System. Very Rare system. 90 Warranty on the system. In the old days, kids couldn't wait till they were old enough to get their first two-wheeler. Now they yearn for their first Game Boy. The original handheld, as shown at CyberiaPC.com, featured a black-and-green LCD and a slot for matchbook-size game cartridges. Later versions became smaller and more powerful but maintained backward compatibility with the original, so you could take your favorite games with you as you grew. The Game Boy's lock on the handheld game market remained virtually unchallenged--at least until the Sony PlayStation Portable arrived this year.